"Arturia Pendragon" redirects here. It is not to be confused with Arthur Pendragon (disambiguation). Saber wielding Excalibur, as seen in Fate/Grand Order. Saber (Japanese: セイバー, Hepburn: Seibā), whose real name is Altria Pendragon (アルトリア・ペンドラゴン, Arutoria Pendoragon), is a fictional character from the Japanese 2004 visual novel Fate/stay night by Type-Moon. In Fate/stay night, Saber is a heroic warrior who is summoned by a teenager named Shirou Emiya to participate in a war between masters and servants in order to accomplish their dreams through the mythical Holy Grail. Saber's relationship with the cast varies depending on the player's decisions, becoming a love interest to Shirou in the novel's first route, a supporting character in the second one or anti-hero titled "Saber Alter" (セイバー・オルタナティブ, Seibā Orutanatibu) in the third one. An agile and powerful warrior, Saber is loyal, independent, and reserved; she appears cold, but is actually suppressing her emotions to focus on her goals. She is also present in the prequel light novel, Fate/Zero, by Type-Moon and nitroplus, which she is the servant of Shirou's guardian Kiritsugu Emiya during the previous Holy Grail war as well as the sequel Fate/hollow ataraxia. Additionally, Saber has appeared in the novel's printed and animated adaptation reprising her role from the game. 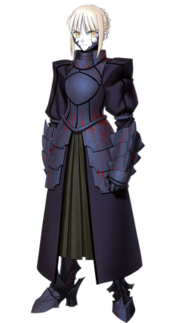 Saber was created by Kinoko Nasu after the main illustrator suggested the idea of having an armored woman as a protagonist for the visual novel with writer Gen Urobuchi commented on her character becoming darker depending on the scenarios. Urobuchi also created his own scenario about how Saber and Kiritsugu interact due to the lack of mentions in regards to how little this was explored in the original visual novel. While Saber has been voiced by Ayako Kawasumi in all of her Japanese appearances, multiple English actors took the role in the dubs of the series' animated adaptations. Critical reception to Saber's characterization and role in the series has been generally positive, most notably her relationship with Shirou. However, some critics have expressed their dislike on how little Saber develops in other series as well as her characterization in Zero as well as her lack of screentime in other anime adaptations. Nevertheless, Saber has also been popular within the Fate series and anime in general. 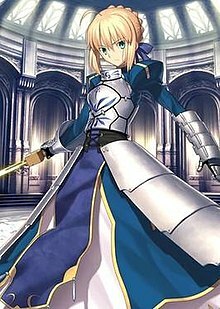 Saber's full name is Altria Pendragon (sometimes translated Artoria or Arturia) a character inspired by the legends of King Arthur. At her nativity, Uther decides to not publicly announce Altria's birth or gender, fearing his subjects will never accept a woman as a legitimate ruler. She is entrusted by Merlin to a loyal knight, Sir Ector, who raises her as a surrogate son. When Altria is fifteen, King Uther dies leaving no known eligible heir to the throne. Britain enters a period of turmoil following the growing threat of invasion by the Saxons. Merlin soon approaches Altria, explaining that the British people will recognize her as a destined ruler if she draws Caliburn, a ceremonial sword embedded in a large slab of stone. However, pulling this sword is symbolic of accepting the hardships of a monarch, and Altria will be responsible for preserving the welfare of her people. Without hesitation and despite her gender, she draws Caliburn and shoulders Britain's mantle of leadership. Despite her immense strength and fighting abilities, Altria is plagued by feelings of guilt and inferiority throughout her reign; she sacrifices her emotions for the good of Britain, yet many of her subjects and knights become critical of her lack of humanity and cold calculation. Excalibur's scabbard is stolen while she repels an assault along her country's borders; when Altria returns inland, she discovers Britain is being torn asunder by civil unrest. Despite her valiant efforts to placate the dissent, Altria is mortally wounded by a traitorous knight, a homunculus born of her blood named Mordred, during the Battle of Camlann. Her dying body is escorted to a holy isle by Morgan le Fay and Sir Bedivere. Altria orders a grieving Bedivere to dispose of Excalibur by throwing it back to Vivian; in her absence, she reflects on her personal failures, regretting her life as king. Before her last breath, she appeals to the world; in exchange for services as a Heroic Spirit, she asks to be given an opportunity to relive her life, where someone more suitable and effective would lead Britain in her stead. She possesses the Noble Phantasm Excalibur: Sword of Promised Victory (約束された勝利の剣（エクスカリバー）, Ekusukaribā), a celestial sword constructed by the world from the collective wishes of mankind and fueled through a conversion of Mana into photoelectric energy, allowing a wave of destructive energy to be released from the tip when swung. Another Noble Phantasm she possesses is Invisible Air: Barrier of the Wind King (風王結界（インビジブル・エア）, Inbijiburu Ea), which compresses and gyrates the air around Saber's blade, turning the blade invisible, making it hard for opponents to judge her strikes, and allowing a one-time release of the air in the form of an intense gust. It also serves to help hide her identity - Excalibur's fame being so great that any other Servant would recognise it the moment they laid eyes on it. Her third Noble Phantasm, the scabbard of Excalibur, Avalon: The Everdistant Utopia ((全て遠き理想郷（アヴァロン）, Avaron), bequeaths limited immortality through regenerative stimulation, prevents physical deterioration due to aging, and when activated, is capable of protecting the user from virtually any attack. She also has a fourth Noble Phantasm, Caliburn: Golden Sword of Assured Victory ((勝利すべき黄金の剣（カリバーン）, Karibān), the sword she initially pulled from the stone as a child. This sword is Saber's favourite, being of a more decorative nature than Excalibur, but was broken during her lifetime. Saber Alter as seen in Heaven's Feel. Due to her darker personality, she has been referred as an anti-heroine by the developers. In the visual novel Fate/stay night, Saber is accidentally summoned by a young mage named Shirou Emiya, stopping the servant Lancer in the process. In the Fate route of Fate/stay night, Shirou and Saber often clash because they do not view their methods of fighting approvable. Despite this, Shirou still does his utmost to convince Saber that what happened in the past cannot be changed, and that trying to change it was nothing but a fool's errand. Once she finds out that the Holy Grail she believed to be omnipotent was actually corrupt and causes only death, she accepts that her noble wish was indeed impossible to accomplish, and works with Shirou to save the world she was summoned in. The two end up developing romantic feelings for one another but decide they would divide once the Holy Grail War is finished. Saber and Shirou win their respective fights with Gilgamesh and Kirei Kotomine. She then destroys the Holy Grail with Excalibur, and after finally accepting Shirou's feelings and confessing her own, is sent back to her original time, dying on the hill. In the PlayStation 2 remake, an extra ending in which Shirou and Saber reunite following their deaths was added. After accepting herself for who she is and passing away, Saber forgoes becoming a Heroic Spirit so as to wait for Shirou in Avalon, the mystical land where only true heroes may reside. She waits for many lifetimes before Shirō finally earns the right to ascend to Avalon, where the two are finally reunited to be together forever. In the Unlimited Blade Works route of Fate/stay night, Saber is stabbed by Caster's Rule Breaker, and is forced to become her Servant. Caster then uses her command spell to force Saber to kill Shirō and Rin Tohsaka, but she then shows her extraordinary magical resistance by resisting the absolute binding power of the command spell, giving Rin and Shirō time to escape. After Caster is killed by Archer, Rin then forges a contract with her, becoming her new Master. She gains a massive power boost from having a proper magus as a Master; however, despite being Rin's Servant, she remains loyal to Shirō since she was summoned by him and has pledged her allegiance and loyalty to him. She then destroys the Holy Grail with Excalibur. In the Good End of this scenario, she lives on in the world as one of Rin's familiars along with Shirō in a polyamorous relationship with the two. In the True End, she disappears after destroying the Holy Grail, similar to the Fate Scenario. In the Heaven's Feel route of Fate/stay night, Saber is consumed by the Holy Grail during a battle with True Assassin and becomes a vastly stronger, corrupted version of her former self, Saber Alter, and a Servant under Sakura Matou, the heroine of this route. While Shirou is on his way to seek an alliance with Ilya and Berserker, she shows up in her Alter form and defeats Berserker, making herself known to Shirou, while nearly killing her former allies. Shirou once again returns to Illya's home and defeats Berserker now working for Sakura. Saber approaches the weakened Shirou but refuses to kill him. In the Normal End and True End, Saber Alter is defeated by Shirou with the help of Rider. Shirou then delivers the killing blow to her while forcing himself to forget all his memories with her. In the sequel, Fate/hollow ataraxia, Saber continues to protect Shirō, though it seems their relationship has turned more towards Saber having the major control over her relationship with Shirō and, if the player chooses, can be pursued romantically once more. She kills Archer when he attacks Shirō in one loop. In another loop, Saber is killed by Bazett Fraga McRemitz's Fragrach when she tried to use Excalibur on Bazett. In the final loop of Fate/hollow ataraxia, Saber aids Shirō/Avenger in reaching the Grail by fending off the mysterious monsters (which were in fact leftover parts of Avenger wishing to continue the loop) with other Heroic Spirits. It is also shown that when the stray hair on her head is pulled, she reverts to her Alter form. Saber Alter is portrayed here as being crude and obsessed with fast food and bad food in general, in direct opposition to Saber's love of Shirou's cooking. In the prequel Fate/Zero Saber is summoned to participate in the 4th Holy Grail War by Kiritsugu Emiya. In order to prepare for the war, Kiritsugu has his wife, Irisviel von Einzbern, to act as Saber's guide while he aids her in the shadows. As in the original visual novel, Saber wishes to obtain the Holy Grail to change her kingdom's past which results in Gilgamesh and Alexander the Great mocking her ideals. During a fight against Lancer, Kiritsugu forces Lancer's Master to committee suicide which results in Saber's anger for not respecting knight's ideals. Shortly afterwards, Irisviel is kidnapped by Kirei Kotomine and Saber goes to find her. On the way, Saber confronts Berserker who is revealed to be her former ally Lancelot. After Lancelot's death, Saber is ordered to destroy the Holy Grail by her then-master, Kiritsugu via use of two back-to-back Command Seals, but only succeeded in destroying its physical form. Saber returns to her world, still aiming to take the Holy Grail for her people. Saber has appeared in the anime and manga versions of Fate/stay night and the movie Unlimited Blade Works. Three of versions of Saber (regular, Saber Alter, Saber Lily) appeared in the fighting game Fate/unlimited codes. The Lily form was based on Saber's alternative outfit from Unlimited Blade Works and the staff noted it was wellreceived by fans. A Lion form of Saber also appeared in Fate/tiger colosseum. She, along with other characters from Tsukihime, Melty Blood, and the rest of the cast of Fate/stay night, appears in the 2011 anime Carnival Phantasm. She also appears in the series Fate/Labyrinth as Manaka's Servant during the Subcategory Holy Grail. Together, they defeat many opponents as well as the bosses of each of the floor levels in Caubac Alcatraz's labyrinth. She also appeared in Fate/Grand Order as her multiple forms (Saber Alter and Saber Lily) as well as her newer forms (Lancer and Lancer Alter) and gag forms (an Archer and Rider Alter form wearing a swimsuit and maid outfit respectively, as well as another rider form as "Santa Alter") introduced in the game. She is one of the Servants of Ritsuka Fujimaru of the Grand Order conflicts of Fate/Grand Order. She additionally appears in Fate/Extella as a secret playable character. She is also present in the manga and anime adaptation Today's Menu for the Emiya Family, living alongside Shirou who explains to her the meals he prepares. Outside Type-Moon's works and adaptations, Saber also appears in the video games Divine Gate and Nitroplus Blasterz: Heroines Infinite Duel. In promoting the animated adaptations of the routes, Saber was added to the games Summons Board, Puzzle & Dragons' and The Alchemist Code. She is also present in Phantasy Star Online 2 and Hortensia Saga. Two videogame adaptations for smartphones, Fate/Zero The Adventure and Fate/Zero Next Encounter, feature Saber. Early sketches of Saber when the character was male. Before Kinoko Nasu started writing Fate/stay night, the route Fate was something he had written for fun in his spare time when he was a student. Shirou and Saber's gender were swapped, mostly due to a previous experience with the novel Tsukihime as Type-Moon believed this would fit the most updated demographic. Takeuchi had the idea of drawing an armored woman which resulted in Saber being female. Takeuchi went to call Saber as one of his favorite Servants in the series to the point of calling her an ideal bride based on the multiple times he illustrates Saber on his free time. The relationship between Shirou and Saber was meant to be different from previous romances in fiction due to the fact Shirou has to accept Saber has to fight for him. As a foreshadow to Shirou and Saber's first meeting, the team included a dream sequence where the former sees the mythical sword Excalibur which the latter wields. Since Shirou possessed the scabbard Avalon from Excalibur, Nasu wrote this to explain how the two become Master and Servant. Nasu originally had an idea to extend the Fate route involving an alternative Fifth Holy Grail War where Shirou fights alongside Saber but the two do not have a romantic relationship. Following their separation, Shirou would bond with Rin in a similar way to the Unlimited Blade Works's "True Ending". Since the "Unlimited Blade Works" is playable after concluding "Fate", Saber's true identity was revealed early in the story. As she is not a romantic interest in this route, Nasu considered as a motherly figure to both Shirou and Rin. In the making of its anime, Nasu said the staff's purpose was to make her more beautiful than in previous Fate series, even more than the heroine Rin. Nasu said itis Shirou and Saber a relationship between a man and a woman. Saber has fought for a long time as the ruler of Britain, but then turned into a girl all of a sudden and fell in love with Shirou. It's pretty ridiculous when you think about it. But I really wanted to push it towards that sort of boy-meets-girl story. So as a last resort, I had Shirou continually say things to her like "But you're a girl," and "Girls aren't supposed to fight," in order to remind the users that "she is really a girl." It's like the author's actually the one trying to convince Saber that she's a girl... I feel like I could have written it a lot better now, but that was the best I could do at the time. It's true that Rin is different from Saber. In regards to the different alternate designs Saber has, Urobuchi referred to Alter as a dark hero rather than a villain while Nasu said she was not yet a pure villain as she was not fully corrupted yet. Nasu further commented on Alter stating she "is an idealist who clings to her own values even though she's been blackened". In the making of Fate/Zero, writer Gen Urobuchi had multiple ideas like Saber being lectured by Gilgamesh and Alexander which motivated Nasu to let write the light novel series. As in the original Fate/stay night Saber states she did not know his former master, Kiritsugu Emiya, properly, Urobuchi created Kiritsugu's wife, Irisviel von Einzbern, in order to facilitate communication between Saber and Kiritsugu. The staff was worried about how Urobuchi would handle the misrelationship he has with Saber as more actions unforgivable by the servant would have made her impossible to trust his adoptive son, Shirou, in the sequel. As a result, Urobuchi had to alter part of his original ideas. Urobuchi stated that in his works the characters who survive to the plot's events become "pillars". While Saber, Kiritsugu, and Kirei Kotomine are the major survivors, Kiritsugu dies offscreen and since Saber does not have a large role in Fate/Zero, the pillar character is instead Kirei. A common inconsistency within Saber is how her first name is written. While Altria Pendragon is the most used, Nasu has also used Artoria Pendragon. As a result, the localization members of the video game Fate/Grand Order have found it challenging to properly write her true name in the game whenever it is needed. Ayako Kawasumi has voiced Saber in Japanese. Kari Wahlgren has voiced Saber in English. Saber is voiced by Ayako Kawasumi in Japanese. She was chosen by Nasu and Takeuchi because they found her voice fitting for Saber's personality with the sound director also suggesting Kawasumi during the making of the series. Kawasumi said regardless of the multiple appearances she has in the Fate/stay night series, her characterization did not change due to her convictions. The actress noted that Saber was drawn by Irisviel due to her love for her family. However, because Saber did not accept Kiritsugu's principles, Kawasumi was regretful of this area regarding her character. Kawasumi noted that Saber's characerization differ in Unlimited Blade Works from the previous ones due to her lack of romantic feelings for Shirou and instead acts more emotionless, seeing Shirou as her Master only. When asked about the heroines within the Fate franchise in general, Kawasumi believed that Saber represents the strong female character type of characters Type-Moon has created. In analysing her character, Kawasumi believes that while Saber commonly acts with the idea of always protecting other people, her appeal causes other characters to wish to protect her. In regards to Fate/Zero, Kawasumi noted that while people saw this version of Saber as a more masculine woman than in the previous series, she still kept her strong sense of self which would make her more recognizable to fans. For the second Heaven's Feel film, Kawasumi expressed mixed thoughts in regards to Saber's darker characterization but still wanted viewers to see her in action. English voice actress Kari Wahlgren said when voicing the character, she became interested in knowing what were future actions during recordings thanks to the major plot twists each of the series she been involving into. Due to Saber being based on King Arthur, Wahlgren said she had no major problems in doing the work as she did Shakespeare in previous jobs. Furthermore, when comparing Saber to a Shakespeare character, Wahlgren said "There’s a little bit of Hamlet in there definitely, and a little bit of The Scottish Play—I won’t say it. Henry V. All the great leaders and warlords." 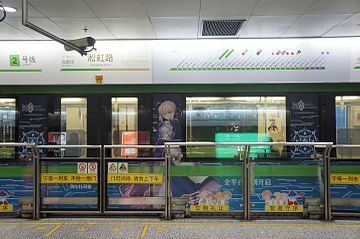 Saber has been popular within marketing of the Fate franchise. In the Type-Moon Fes. 10th Anniversary Event, she was ranked 1st amongst all characters created by Type-Moon. In 2012, Niconico News made a poll in which they requested people which characters from Fate/Zero they wanted as boyfriends or girlfriends. Saber topped the girlfriend side with a 34.1%. In an Unlimited Blade Works poll she took fourth place. In 2011 Manga artist group Clamp drew their own take of Saber in celebration of the premiere of Fate/Zero. In a Newtype poll she took the second spot in female characters from September 2017. In top 30 characters of the 2010s from the same magazine, Saber topped the female cast. In 2017, a cafe using Fate based characters including Saber was released in Osaka, Japan. She was also voted as the best servant from Fate/Zero during 2012. Japanese figure maker Good Smile Company made a poll in which they asked fans which figures they wanted the most. Two incarnations of Saber made it to figure category: her regular look and his Lily form from Unlimited Codes. Numerous figures of Saber have been created, including all three forms of her and a keychain replica of her sword. Another replica includes her motorcycle from Fate/Zero. She was also voted as the best servant from Fate/Zero during 2012. Saber was also the most voted female Fate/Zero character men would like to date. In promoting Fate/Grand Order, artist Yoshitaka Amano provided his rendition of Saber in the Japanese convention AnimeJapan during March 2019. In a Manga.Tokyo poll from 2018, Saber was voted as the most popular Fate character. Critical reception to Saber has generally been positive. Kimlinger later highly praised the character as "Saber alone is worth the price of admission" when watching the series, also commenting on her fight scenes. He added "the results are positively exhilarating, cementing Saber's status as one of the coolest heroines to come down the anime turnpike in quite some time." Mania Entertainment's Chris Beveridge liked the development of Saber across the series particularly her team ups with Shirou. He shared similar comments when talking about the romantic relationship between her and Shirou. Similarly, DVDTalk enjoyed this and claimed "the Master/Servant relationship is an interesting one and though Saber appears to be robotic at times there are glimmers of feelings beneath her cold exterior." Anime News Network's Carl Kimlinger referred to her and Archer as "the only spices" of the series. IGN's Jeff Harris said that Shirou and Saber's growing relationship was Fate/stay night most interesting plotline and that the romantic tension there between the two is something to look forward to over the course of the rest of the series. Urobuchi believes Saber's relationship with Shirou does not seem like a realistic relationship between a male and a female, but a complicated relationship with a boy who became a girl. He further explains that it is not a relationship fueled by instinct like the relationship between a man and a woman, but a romance of logic between two people who need each other from the heart. He thinks the Fate route could have been told as a story through the ancient Greek views on love. On the other hand, the duo was felt to be the least interesting from the anime Unlimited Blade Works as Rin Tohsaka and Archer felt more entertaining than them according to UK Anime Network. Anime News Network found Saber's fight against Berserker as one of the most appealing battles in the Unlimited Blade Works film by Deen. In regards to Saber's role in the first Heaven's Feel film, the Fandom Post enjoyed the way Saber initially started her bond with Shirou but lamented but how in the end she had little importance during the movie. Her transformation into Alter and fight in the second Heaven's Film earned major praise by Fandom Post, labeling as one of the biggest highlights of the sequel. In regards to the prequel Fate/Zero, Anime News Network praised the tragedy that happens to both Saber and Kiritsugu despite each character wishing for solutions to world issues making the series worth watching. The writer also noted how both Saber and Kiritsugu are opposites due to their different backgrounds while at the same time being similar. Anime News Network's Carlo Santos praised her fight against Lancer in Fate/Zero which served as a good counterpart to expositions in the story. Kotaku enjoyed the way the series' handled how Saber, Gilgamesh and Alexander the Great discussed their ideals as kings and how their people should be treated, giving each character different philosophies. THEM Anime Reviews agreed, seeing as a more explored area rather than the rivalry between Kiritsugu and Kirei Kotomine. UK Anime Network stated that Saber felt like the Servant who lacked a character arc based on how she is mocked by her rivals for her beliefs with her misrelationship with Kiritsugu showing more conflict within her. The Fandom Post agreed, finding Saber as one of the weakest Servants from Fate/Zero due to her lack of skills and motivations with the latter being found as mocked by other characters, much to the surprise of the former viewers of the Fate franchise. Anime News Network also criticized Saber's personality, calling it a "pretty generic lady knight" in most of her appearances but her charming side from Today's Menu for the Emiya Family was better received instead. Michelle Ruff's English performance as Saber has led to negative criticism for leading an unfitting tone as the character in comparison to Kate Higgins with Anime News Network criticizing her lack of dialogues in the Unlimited Blade Works movie. ^ a b "Two Magi (Part Two)". Fate/stay night (DVD). Episode 6. Sentai Filmworks. 2013. Event occurs at 24:14. Following the Japanese credits of this episode, the closing credits are presented in English with: English Vocal Cast, Japanese Vocal Cast. ^ "ANIMATION|Emily Woo Zeller". Archived from the original on 2018-10-27. Retrieved 2018-10-27. ^ Martin, Theron (2012-06-07). "Fate/stay night: Unlimited Blade Works - Blu-Ray review". Anime News Network. Archived from the original on 2012-06-15. Retrieved 2012-06-14. ^ "Fate/Apocrypha English Cast and Crew". igmur. 2017-02-12. Archived from the original on 2019-02-18. Retrieved 2018-02-10. ^ "Fate/Grand Order Saber Arturia Pendragon 1/7 Scale Figure (Delue Edition)". Amazon.com. Fate/Grand Order. Archived from the original on 18 February 2019. Retrieved 27 December 2018. ^ "Aniplex". Aniplex. Archived from the original on 2017-12-14. Retrieved December 12, 2017. Altria Pendragon Aniplex merchandise. ^ "TYPE-MOON Ace 11". Aniplex. Archived from the original on 2018-04-01. Retrieved December 12, 2017. Officially translated English name. ^ "Fate/Grand Order USA". Fate/Grand Order. September 8, 2017. Archived from the original on February 18, 2019. Retrieved December 12, 2017. Officially translated English title. ^ "Good-Smile Figures". Good-Smile Company. Archived from the original on 2017-12-14. Retrieved December 12, 2017. Official merchandise titles. ^ Type-Moon. Fate/stay night. Type-Moon. Level/area: Fate: Day 12. ^ Type-Moon. Fate/stay night. Type-Moon. Level/area: Day 11. ^ Type-Moon. Fate/stay night. Type-Moon. Level/area: Prologue. ^ Shūsei, Sakagami (2017). TYPE-MOONの軌跡. Tokyo: Seikaisha. pp. 79–80. ISBN 9784065105573. OCLC 1013875576. ^ Type-Moon. Fate/stay night. Type-Moon. Level/area: Fate: True End Continuation of the Dream. ^ Type-Moon. Fate/stay night Realtta Nua. Kadokawa Shoten. Level/area: Fate: Last Episode. ^ Type-Moon. Fate/stay night. Type-Moon. Level/area: Unlimited Blade Works: Day 14. ^ Type-Moon. Fate/stay night. Type-Moon. Level/area: Unlimited Blade Works: Good End [sunny day]. ^ Type-Moon. Fate/stay night Réalta Nua. Kadokawa Shoten. Level/area: Unlimited Blade Works: True End [Brilliant Years]. ^ Type-Moon. Fate/stay night. Type-Moon. Level/area: Heaven's Feel: Day 15. ^ Type-Moon. Fate/stay night. Type-Moon. Level/area: Heaven's Feel: Day 16. ^ Type-Moon. Fate/hollow ataraxia. Type-Moon. ^ Urobuchi, Gen; Takeuchi, Takashi (2007). "Epilogue". Fate/Zero. 4. Type-Moon. ^ Nishiwaki, Dato (2006). Fate/stay night. Kadokawa Shoten. ISBN 9784047138254. ^ Fate/stay night: Unlimited Blade Works (DVD). 2010. studio: Deen. ^ "Characters". Capcom. Archived from the original on March 8, 2013. Retrieved February 28, 2019. ^ Fate/unlimited codes : 武内崇X日暮竜二X 土屋和弘が語る制作秘話 : [яп.] / Type-Moon // Type-Moon ACE. — Tokyo : Kadokawa Shoten, 2009. — № 2. — P. 48—61. ^ "Fate/tiger colosseum homepage". www.capcom.co.jp. Archived from the original on March 5, 2012. Retrieved 2015-11-15. ^ "The 5th Great Clash of the Magicians: The Holy Grail War". Carnival Phantasm. Lerche. August 12, 2011. ^ Type-Moon. Fate/Grand Order. Level/area: GUDAGUDA Honnouji. ^ Fate/Grand Order material I. Type Moon. p. 28. ^ "How to Unlock Artoria in Fate/EXTELLA: The Umbral Star". Marvelous Games. Archived from the original on 2019-02-14. Retrieved February 13, 2019. ^ "Fate Spinoff Manga Today's Menu for Emiya Family Gets Net Anime". Anime News Network. Archived from the original on 2017-12-31. Retrieved December 14, 2018. ^ "Fate/Stay Night Characters Make Cameos In Divine Gate". Siliconera. Archived from the original on 2018-12-28. Retrieved December 27, 2018. ^ "Saber From Fate/Zero And Akane From Psycho-Pass Are In Nitroplus Blasterz". Siliconera. Archived from the original on 2019-01-19. Retrieved January 18, 2019. ^ "Collab Fate". GungHo Online Entertainment. Archived from the original on 2019-02-03. Retrieved February 2, 2019. ^ "Fate/stay night [Heaven's Feel] Collab Arrives!". Puzzle & Dragons. Archived from the original on February 14, 2019. Retrieved January 28, 2019. ^ "Limited Fate/stay night [Unlimited Blade Works] Crossover With The Alchemist Code Smartphone Game". Manga Tokyo. Archived from the original on 2019-02-14. Retrieved February 13, 2019. ^ "Dress Up As Saber, Archer And Rin In Phantasy Star Online 2's Fate/Stay Night Collaboration". Siliconera. Archived from the original on 2019-02-14. Retrieved January 13, 2019. ^ "【独占】SR"衛宮士郎"のイラスト先出し！『オルサガ』×『Fate[UBW]』コラボ事前クエスト開始". Famitsu. Archived from the original on March 30, 2019. Retrieved February 20, 2019. ^ "Fate/Zero The Adventure Coming To iPhone This Spring". Siliconera. Archived from the original on 26 February 2015. Retrieved 26 February 2015. ^ "Servants Gather For Fate/Zero: Next Encounter". Siliconera. Archived from the original on 26 February 2015. Retrieved 26 February 2015. ^ a b Nasu, Kinoko; Takeuchi, Takashi (2006). "The Fate/stay night Staffs Interview". website (Interview). Dengeki Online. Archived from the original on 2018-06-12. Retrieved 27 August 2018. ^ "Kinoko and Takashi Q&A - Fate/stay night [Unlimited Blade Works]". Tsukikan. Archived from the original on 2018-12-15. Retrieved December 14, 2018. ^ a b c "Nasu Kinoko X Takeuchi Takashi X Urobuchi Gen – Special Forum". Archived from the original on 2015-04-14. Retrieved 2015-04-06. ^ Fate/complete material III. Techgian. 2010. pp. 130–136. ISBN 978-4047269026. ^ Fate/stay night Unlimited Blade Works Blu-ray Disc Box I Booklet. Type-Moon. 2015. p. 5. ^ Urobuchi, Gen; Takeuchi, Takashi (2005). Fate/Zero. 1. Type-Moon. pp. 237–241. ^ "Interview: Fate/Zero Screenwriter Gen Urobuchi". Anime News Network. October 21, 2011. Archived from the original on 2017-07-17. Retrieved November 21, 2018. ^ "Roundtable Interview with Gen Urobuchi, Atsuhiro Iwakami and Katsushi Ota". The O Network. Archived from the original on 2018-12-16. Retrieved December 15, 2018. ^ "Aniplex of America Interview: Part 1". Grand Order. Archived from the original on 2018-08-16. Retrieved January 6, 2019. ^ "Interview: Ayako Kawasumi". Anime News Network. Archived from the original on 2018-12-07. Retrieved December 10, 2018. ^ "Ayako Kawasumi Interview @ Anime Expo 2015". T Ono. Archived from the original on 2018-12-28. Retrieved December 27, 2018. ^ "Fate/stay night: Heaven's Feel Movie Premiere Stage Greeting Report". Manga.Tokyo. Archived from the original on February 19, 2019. Retrieved February 18, 2019. ^ "Interview With Voice Actress Kari Wahlgren of FLCL, NARUTO, SAMURAI CHAMPLOO, RICK AND MORTY, And More". Asian Crush. Archived from the original on 2018-12-31. Retrieved December 30, 2018. ^ "TYPE-MOON Fes". TYPE-MOON. Archived from the original on 2017-12-14. Retrieved December 12, 2017. ^ "MyNavi Poll: Which Fate/Zero Character to Go Out With". Anime News Network. Archived from the original on 2017-07-31. Retrieved January 5, 2018. ^ "Fate/stay night [Unlimited Blade Works] Poll". Ufotable. Archived from the original on 10 November 2015. Retrieved 4 April 2017. ^ "CLAMP Draws Fate/stay night's Saber". Crunchyroll. Archived from the original on 2019-01-10. Retrieved January 10, 2019. ^ "Top 10". Newtype (in Japanese). Kadokawa Shoten. September 2017. ^ "Top 30 characters of the 2010s". Newtype (in Japanese). Kadokawa Shoten. July 2018. ^ "Fate/stay night Heaven's Feel Animate Collaboration Cafe Announced". Manga.Tokyo. Archived from the original on 2018-12-15. Retrieved December 13, 2018. ^ "MyNavi Poll: Strongest Fate/Zero Master & Servant". Anime News Network. Archived from the original on February 24, 2019. Retrieved February 23, 2019. ^ "Good Smile Company's 10th Anniversary Figure Vote Results Posted". Anime News Network. Archived from the original on 2017-08-01. Retrieved January 5, 2018. ^ MyFigureCollection. "Search Results : MyFigureCollection Saber". Archived from the original on 2019-02-18. Retrieved 2017-12-13. ^ Fate stay Night replica Saber's Excalibur Keychain. "Fate stay Night replica Saber's Excalibur Keychain: Toys & Games". Amazon.com. Archived from the original on 2009-09-06. Retrieved 2013-02-08. ^ "Fate/Zero's Saber Motored Cuirassier Statue Out Today; Here's A Closer Look". Siliconera. Archived from the original on 2019-02-14. Retrieved February 13, 2019. ^ "Poll: Japanese Fans Name "Fate/Zero" Characters They Want to Date". Crunchyroll. Archived from the original on February 24, 2019. Retrieved February 23, 2019. ^ "Check Out Yoshitaka Amano's Fate/Grand Order Artwork from AnimeJapan". Anime News Network. Archived from the original on March 27, 2019. Retrieved March 27, 2019. ^ "Choose the Best Fate/stay night Character and Route!". Manga.Tokyo. Archived from the original on April 21, 2019. Retrieved April 21, 2019. ^ "Fate/stay night DVD 3 – Master & Servant". Anime News Network. Archived from the original on 2014-09-23. Retrieved October 8, 2014. ^ "Fate / Stay Night Vol. #5". Mania Entertainment. Archived from the original on October 13, 2014. Retrieved October 8, 2014. ^ "Fate / Stay Night Vol. #4". Mania Entertainment. Archived from the original on October 13, 2014. Retrieved October 8, 2014. ^ "Fate/Stay Night 3: Master & Servant". DVD Talk. Archived from the original on 2014-10-16. Retrieved October 8, 2014. ^ "Fate/stay night DVD 1 – Advent of the Magi". Anime News Network. Archived from the original on 2014-09-23. Retrieved October 8, 2014. ^ Harris, Jeff (September 6, 2007). "Fate/Stay Night: Volume 3 – Master and Servant". IGN. Archived from the original on 2017-12-02. Retrieved April 6, 2015. ^ "Fate/Stay Night: Unlimited Blade Works - Part 1". UK Anime Network. Archived from the original on 2018-11-24. Retrieved November 23, 2018. ^ "Fate/stay night: Unlimited Blade Works". Anime News Network. Archived from the original on December 7, 2018. Retrieved April 23, 2019. ^ "Fate/Stay Night Heaven's Feel I. Presage Flower Limited Edition Blu-ray Anime Review". Fandom Post. Retrieved January 10, 2019. ^ "Fate/Stay Night: Heaven's Feel II. Lost Butterfly Anime Review". Fandom Post. Archived from the original on March 31, 2019. Retrieved March 10, 2019. ^ "Fate/Zero Blu-Ray - Box Set 2 Limited Edition". Anime News Network. Archived from the original on 2017-07-13. Retrieved December 15, 2018. ^ "Fate/Zero Sets a High Bar for All Other Fighting Anime". Kotaku. Archived from the original on 2017-12-22. Retrieved December 15, 2018. ^ "Fate/Zero". THEM Anime Review. Archived from the original on 2017-12-19. Retrieved December 23, 2018. ^ "Fate/Zero - Part 2". UK Anime Network. Archived from the original on 2018-12-16. Retrieved December 15, 2018. ^ "Fate/Zero Limited Edition Blu-ray Box Set 1 Anime Review". The Fandom Post. Archived from the original on 2019-01-15. Retrieved December 29, 2018. ^ "The Real Anime Inspirations Behind the Creations of Re:Creators". Anime News Network. Archived from the original on 2018-12-31. Retrieved December 29, 2018. ^ "Today's Menu for the Emiya Family". Anime News Network. Archived from the original on 2018-03-03. Retrieved February 13, 2019. ^ "Fate/stay night: Unlimited Blade Works". Anime News Network. Archived from the original on 2018-12-07. Retrieved January 3, 2019. This page was last edited on 24 April 2019, at 22:34 (UTC).